"Donde esta el peligro" indeed! It's got plastic hoses on the water connections and a switch on the socket-outlet, what more do you want? Gee you people are tough to please. Besides, that flex there would make a rather handy towel hanger. People are so critical here. Look- there's a nice drip loop in the cord which also makes a handy "grab bar" in case you slip on the slick floor. You know, I was so preoccupied looking at the wiring, that I've only just noticed how that water heater is being held against the wall. Better not hang too many towels on the cord, or use it as a hand-grab too often! OK, I see what you saw now. Now I would really run away faster! I wonder, how good is that sealant job, behind that wooden plate that holds the socket-outlet to the wall? Usually one should use 732 RTV sealant, I'm sensing that corners may have been cut here. 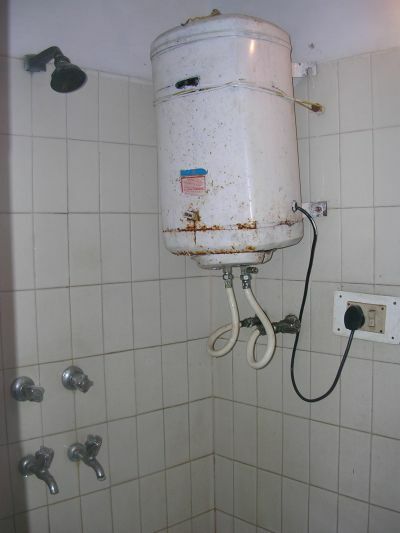 First off, having the water heater literally hanging in the shower, as shown, is typical. Having a switch is also typical .... that is what controls the water heater. That is, if left on, the water heater will ultimately start venting; there is no thermostat. You actually turn the thing on, wait a bit, then take your shower - turning it off as you exit. However, the switch is more commonly mounted on the outside wall of the room, and often has a pilot light, letting you know its' on. Having the switch right next to the heater is a new twist. As is the receptacle; typically ordinary flex is used (not sealtight). One detail not obvious in the picture is that the entire service is likely RCD (GFI) protected.